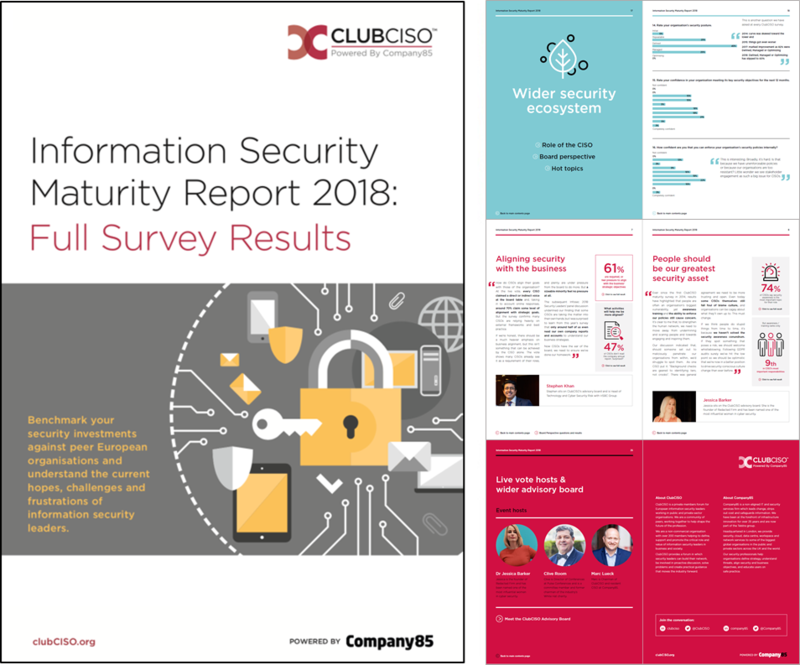 This is the fifth ClubCISO Maturity Report compiled from an anonymous survey of 41 senior executives with responsibility for their organisations' information security, polled at a ClubCISO live vote event and online during May 2018. The report identifies clear trends across the UK information security landscape, enables businesses to benchmark their security investments against peer organisations and illuminates the current hopes, challenges and frustrations of information security leaders. You can navigate to the precise questions and sections that are most interesting to you. This document also includes commentary on some of the main conclusions from this year's results, including Dr Jessica Barker on people as a security asset, Stephen Khan on aligning security with the business and Paul Heffernan on digital transformation. This download outlines the full results. If you would like to read the headline conclusions, click here to download the executive summary document.